entertaim.net: Hi, how are you? Well, I just listened to the „Green River Thriller“-EP … awesome ! Jet’s start with the video to the title track. What was the inspiration? Anna Monteith: Hi Dennis! Nice to meet you! Our title track is actually based on an American serial killer named Gary Ridgeway, also known as the Green River Killer. Responsible for the deaths of at least 71 women over the years, he was given the nick name ‚Green River Killer‘ as his first five victims were found in the Green River in America. Brutal right? I always had a fascination with serial killers and horror movies, particularly the story of Gary Ridgeway. He got away with soooo many brutal murders, I wanted to write something based on us girls getting back at that motherf###er, ya know? entertaim.net: You also wrote a song named „Scream Queen“ … you guys really love horror movies, don’t you? What if you had a real huge budget for making another video … how would it look like? Many explosions and stuff like that? A.M.: (laughing) Yes we do!!! Real huge budget? That would be nice (laughing)… Well we have another track in the works right now, based off everyones favourite vampire stories. I want to have the music video filmed in this creepy abandoned theme park in East Berlin I once visited, not so much explosions, but blood. Lots of it! entertaim.net: Sounds good! You also covered „Turn on the night“ by KISS … by the way … I love that song and I also love your version? But why KISS for a Punk inspired band? A.M.: Yes we did! Thank you! Glad you liked it! Ahh yes, well we love the idea that any band can make their own version of any genre. „Turn on the Night“ is my favourite KISS track and I always wanted to do a more punk style cover of it. So why the hell not, you know? Once Bruce Kulick was keen to feature on our version – it was a definite must! And he did a wonderful job. I think we accomplished the goal there. entertaim.net: You’re going to play some live shows in Germany soon. Do you have any expectations yet? A.M.: Yes we are. Well we are hoping to see that people still like to go out to shows in Germany! You know, with new generations and stuff – the would rather watch Netflix or take useless photos of themselves…. entertaim.net: You’re from New Zealand but now you’re located in Munich and Udine. Can you explain why these two cities? A.M.: I moved to Munich a year ago now and the goal was to have Blue Ruincontinue overseas and tour overseas. Theres only so far New Zealand can take ya… Charlotte, our singer still lives in New Zealand and she comes to Europe when we have things going on! Before I moved to Munich, I tracked down our Italian ladies through social media and things just went from there! A.M.: The feedback has been awesome! It is really nice to see so much support in all these new places. We have had some great reviews online and people really dig our kind of Misfits meets Green Dayvibe. 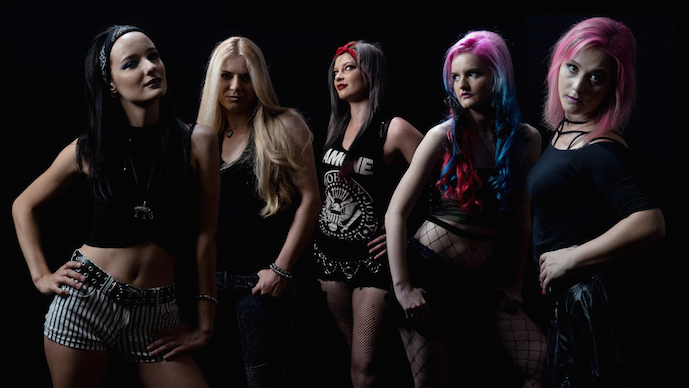 Of course you get those people that say we sound like this girl band and that girl band, but they obviously havent listened to us if that is their opinion… People tend to put this label on female bands because they are female. Saying we sound like The Runaways is like saying Metallicasounds like Blink-182, if you know what I mean… We played some amazing shows in New Zealand and did really well, but Europe is a totally different ball game and we cant wait to meet all our new fans! A.M.: Thanks! We look forward to meeting you too! Rock on!